This step is mainly about timing, readiness, and the sellability of your business. Is your business prepared for sale? Here's where the key online tools on ExitAdviser play an important role. The Business Valuation Tool uses the tried-and-tested DCF method to bring an objective approach to business valuation, helping you to defend your Asking Price with prospective buyers. In parallel, the Sales Memorandum Tool brings focus to the key information that serious buyers will want to know. When writing this concise Memorandum of Sale, you automatically populate fields within the Landing Page of your own advertising campaign on Google, managed with the Go-to-Market Tool. Almost every purchase today begins with a search on the internet, and the shoppers looking to buy your business are any different. ExitAdviser gets your offer in front of potential buyers with the Go-to-Market Tool. 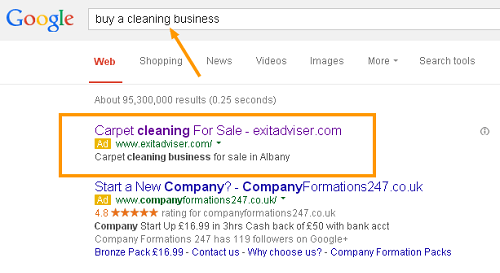 It launches your own advertising campaign on Google Search, which will lead potential buyers to your Landing Page. ExitAdviser provides you a full set of legal forms and templates to download. You'll require a commitment in principle from the buyer, typically a Letter of Intent or a Term Sheet. Following Due Diligence and detailed negotiations, obtaining signatures on a Business Sale Agreement is the target outcome for both parties. At the final stage, it's the detail that counts. It is advisable to use the services of an attorney. If you need to identify one, then try using ExitAdviser's Talk-to-Advisors tool.